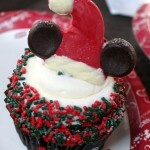 It’s Disney Cupcake Time! And for this round of sweet snacking, we’re checking out Contempo Cafe, one of our favorite spots to snag one of these mammoth snacks! Located steps away from Magic Kingdom — or a convenient stop on the Resort Monorail line — Contempo Cafe is a great spot to grab a delicious lunch or dinner under the soaring atrium of Disney’s Contemporary Resort. If you’re looking for real sustenance, try their Beef Pot Roast or Hot Smoked Turkey Sandwich. 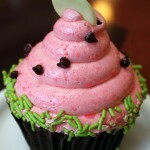 But it’s also a great stop on any Cupcake Crawl! While you can usually find a classic or two in their case, like the Red Velvet Cupcake, it’s always fun to see their new and seasonal varieties as well! 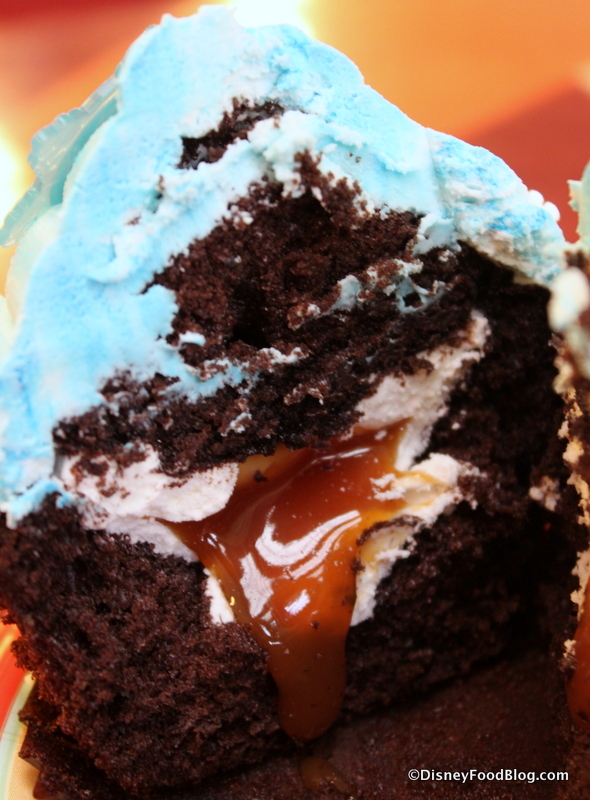 We’ve shown you the Frozen Cupcake before…but this time I get to review it for realz. 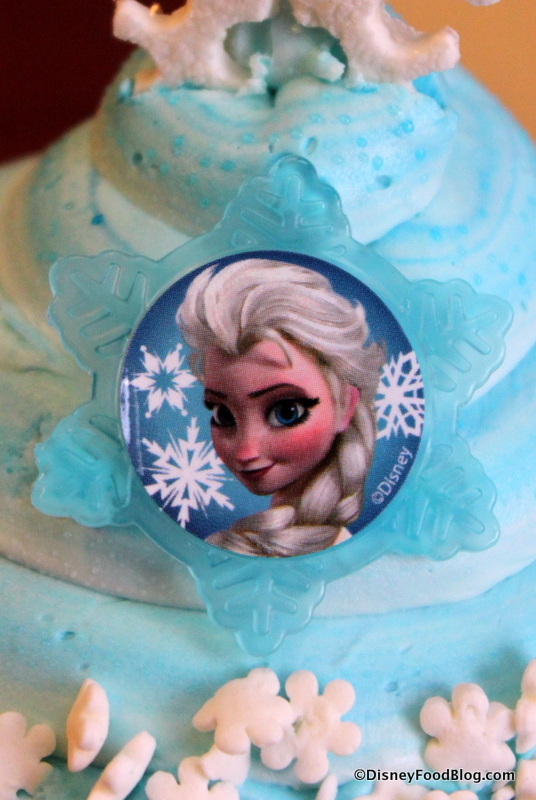 Nope — the cupcake isn’t frozen. Elsa is here in name only. The streaky Blue Frosting, the Dark Chocolate Cupcake, and the Elsa (or other cast member) Ring and Snowflake Garnish all make for striking visual impact. 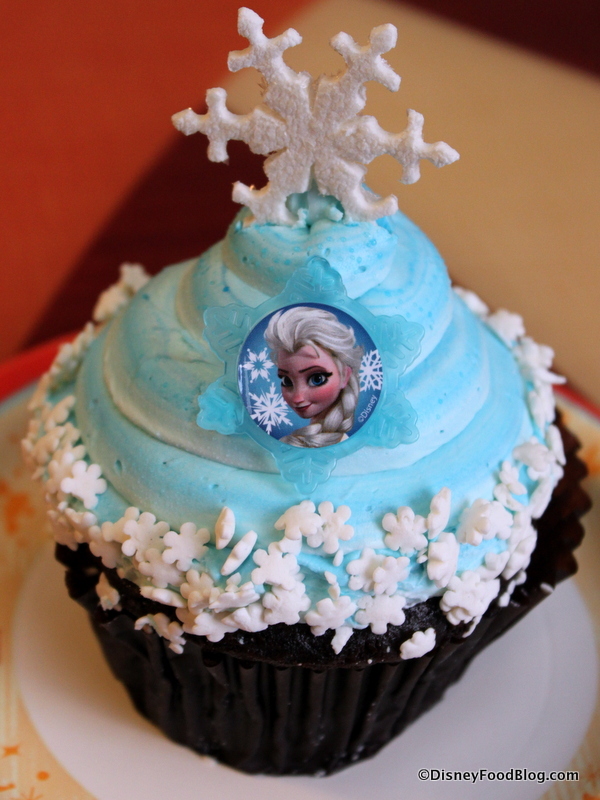 Yep, when I was there I got to choose from several different Frozen cast members to adorn my cupcake. Sven, Kristoff, Elsa… take your pick. And that special plastic ring is settled into a plain vanilla buttercream frosting that’s — typical of Contempo Cafe — a little lighter than you may find elsewhere in the parks and resorts. It’s kind of a cross between the consistency of “lard-y” buttercream and whipped cream. You guys know how I feel about frosting, and I’m not opposed to this variety, it’s just not my favorite. 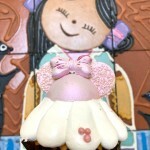 Cut the cupcake open, and we see, again, the familiar Contempo Cafe cupcake set up. Inside of this one, there’s my favoritesuper thick Buttercream Frosting that holds a Caramel Sauce center. (What? Two fillings? I kid you not.) It’s a good contrast of texture, even though the flavors are sweet, sweet, and more sweet with a hearty dose of rich. It was pretty good! I was impressed! If you have a little fan of the film, or you just really love jumbo cupcakes, I say get yourself over to the Contempo Cafe for dessert. I think you’ll like this one. 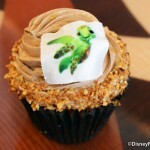 Does the Frozen Cupcake from Contempo Resort appeal to you? Tell us what you think of this one in a comment below! I love chocolate and caramel so I would def. try one of these cupcakes. The center combined with the buttercream looks to good to resist. 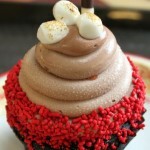 I liked this cupcake before it was the “Frozen” cupcake when it had a gooey chocolate filling inside. Even though I love caramel, this doesn’t appeal to me as much.